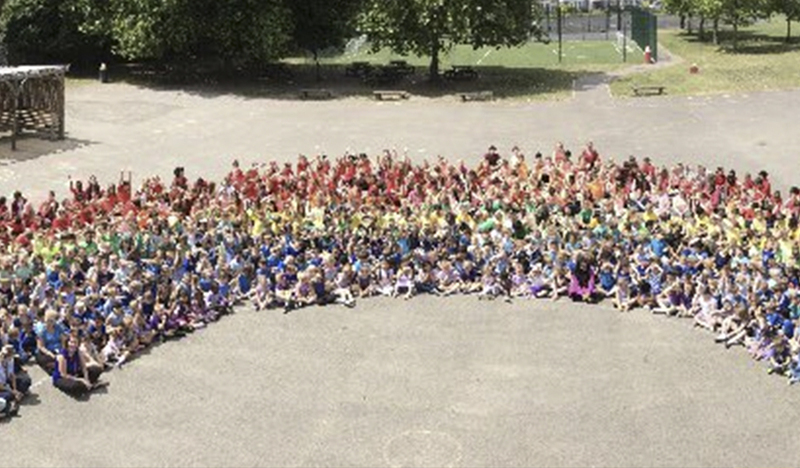 Last month, 670 children aged 4 to 11-years-old from Danetree School formed a human rainbow to raise much needed funds for families with a seriously ill child. Danetree School’s Rainbow Day brought together the entire school to sell cakes and dress in multi-coloured mufti for the day. Each year group were assigned a colour to wear for the day and were asked to provide a small donation in-lieu. They also held a bake sale with tasty baked rainbow cakes and other colourful baked goods. In total, the school raised an incredible £578.34 which could pay for the transport costs for a Family Support Worker for an entire month - allowing up to 25 families to cope with numerous hospital appointments for check ups and treatment, which for many families, involves navigating long distances to unfamiliar cities and dealing with the complexities of public transport with a sick child. If you’d like to hold your own Rainbow Day, you can find out more information here, or contact our regional team if your school would like to fundraise for us.